drawing work, through to the detailed discussions and testing of steel fabrication requirements or mechanical services, the project team has used the 3D model in numerous ways. Team meetings often take place with the model projected on the wall running directly in ArchiCAD, allowing us to interrogate any part of the building and test ideas by making live adjustments. Using both BIMx and Tekla BIMsight we’ve also been able to issue the model to others in a format that allows them to view the information on their own machines without additional training of hardware requirements. We issue the files using our online project management tool – Basecamp, ensuring that file sizes and e-mail constraints don’t prevent access. Whilst full integration and use of the model on screen is the obvious goal with BIM, the value of simply improving drawing output with more 3D information should not be overlooked. Being able to better understand the overall geometry of the buildings thanks to wireframes or cut-away sections has also been welcomed by the site management. 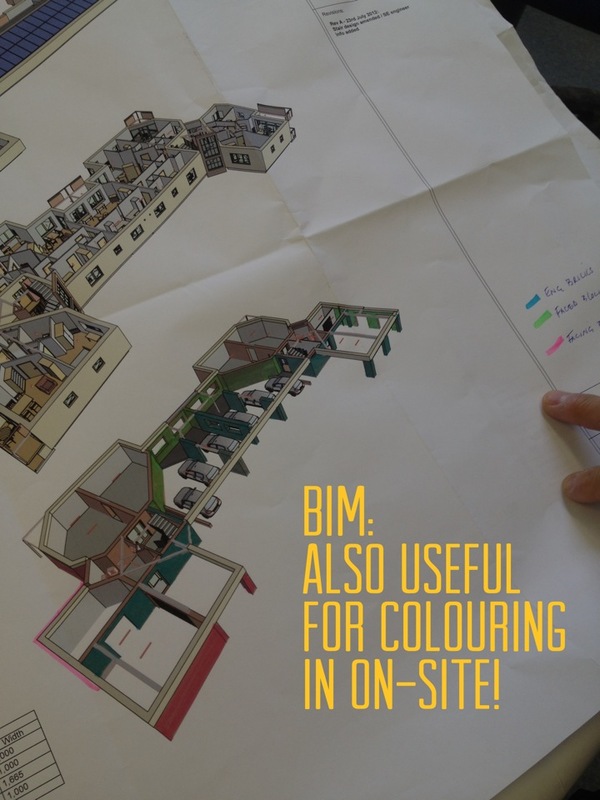 The construction sector has been debating the cost of BIM adoption exhaustively for several years and much discussion centres around the value of the return on investment, particularly for small practices like ours. Our experience in this first year of full adoption has proved to us on many occasions that moving to BIM tools was the right decision. Choosing to offer BIM output as a standard part of our service on all our projects in future is how we intend to continue improving our service and providing value to our clients. Next comes the challenge of working with other BIM ready clients and contractors to explore all the possibilities of a complete virtual building model, from concept to construction and on to hand over and facilities management… Who’s up for it?